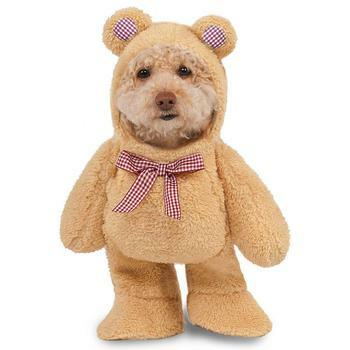 This adorable one-piece costume features ultra plush furry fabric to help your pet be cozy and warm. The brown checkered fabric ears and bowtie offer a charming country charm feel to this super adorable costume. Easy on-just has your pet put their head into the hood from the back and secure it with the touch fastener at the neck. Use the draw-string opening to keep the hood secure around your pet's face. Next, insert your pet's front legs into the feet of the teddy bear costume. The stuffed bear arms will jiggle as your pet walks for a whimsical animated look.